I cannot believe I found this little gem. Today was difficult, since it's a Thursday, it means revisit time... Yet none of the artists I have reviewed this week have a music video released in 2009 or earlier. Until I found out that Nathan Sykes entered Junior Eurovision Song Contest 2004, and also released this song as a promotional single, not that I can find it available to buy anywhere. This is the only video I can find too. Nathan Sykes proves he can dance in sync with this video, vocals may not be on point, but they don't matter since he is looking adorable, he has grown into one hot guy now. Nathan Sykes had won a few awards and competitions by this point, and so taking his chances with Eurovision, might not have served him good. In recent years I have become obsessed with Eurovision, many countries take it so seriously, and it's about time the United Kingdom stopped joking around and started to take it seriously too, the competition is not what it used to be, credible acts get sent there and the rightful winner wins, not because of neighbour voting or countries past conflict, and the voting proves that as each year passes, sometimes shocking us. 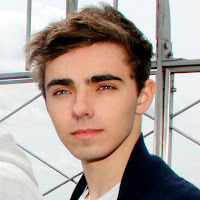 Nathan Sykes came third in the UK selection behind unheard names Cory Spedding and Andrew Merry (the latter became part of The Risk on The X Factor Series 8, which have disbanded). Will Nathan Sykes take a shot at the main contest in the next few years? Or was this something he didn't care all that much about? We do need a credible act to represent us soon. This is a full performance video, no official music video was released, and so I have the video that is of the UK's selection for the Junior Eurovision Song Contest 2004, which was shown on ITV2. A typical kids song, with typical kids dance moves incorporated into a choreography, that isn't so bad when watched again. Good staging, although not that impressed with his fashion choices. Nathan Sykes wasn't exactly Born To Dance, but definitely born to sing, his music career has only just started and he has definitely improved because "Over And Over Again" is a stunner!